Top sports brand Adidas claims to take human rights seriously. Yet it is a major sponsor of the Israel Football Association (IFA), which is implicated in human rights violations against the Palestinian people. The IFA allows football clubs based in illegal Israeli settlements to participate in its leagues and competitions. Hundreds of Palestinian children have had their schools demolished, and sewage from settlements contaminates the fields where they play, while across the road they see the flush green Israeli football fields on stolen Palestinian land. Under International Law, Israeli settlements are war crimes. Adidas’ sponsorship of the IFA directly whitewashes these crimes. Palestinian football clubs have called on Adidas to end its sponsorship of the IFA. Adidas cares a lot about their brand - because if their brand is hurt their business is hurt. Let's show Adidas that their loyal customers around the world will stop trusting and buying their products if they don't end their complicity in human rights violations. Tell Adidas to stop supporting war crimes! We call on Adidas to end its sponsorship of the Israel Football Association (IFA) due to its deep complicity in Israel’s violations of international law and Palestinian human rights. The IFA holds football matches in illegal Israeli settlements in the West Bank. Palestinian children and their families are being pushed from their homes to give way for these settlements. The IFA is also silent on Israel’s attacks against Palestinian football players, many of whom have been arrested or prevented from playing matches. Adidas’ sponsorship of the IFA, an entity complicit in Israel’s war crimes, exposes it to global consumer-led boycott campaigns. Adidas, do not lend your brand to covering up and whitewashing Israel’s human rights abuses. End your sponsorship of the Israel Football Association (IFA). 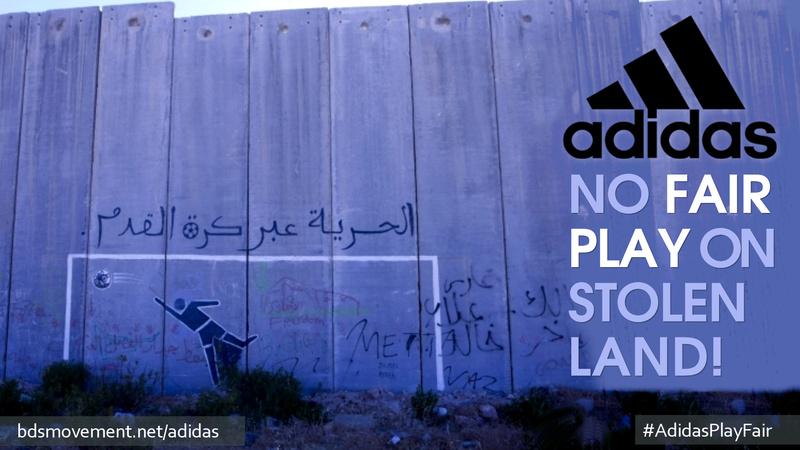 Thank you for signing the petition urging Adidas to stop sponsoring Israeli settlement teams.